Healthworks has been helping businesses improve their employees’ health and productivity for more than 30 years. 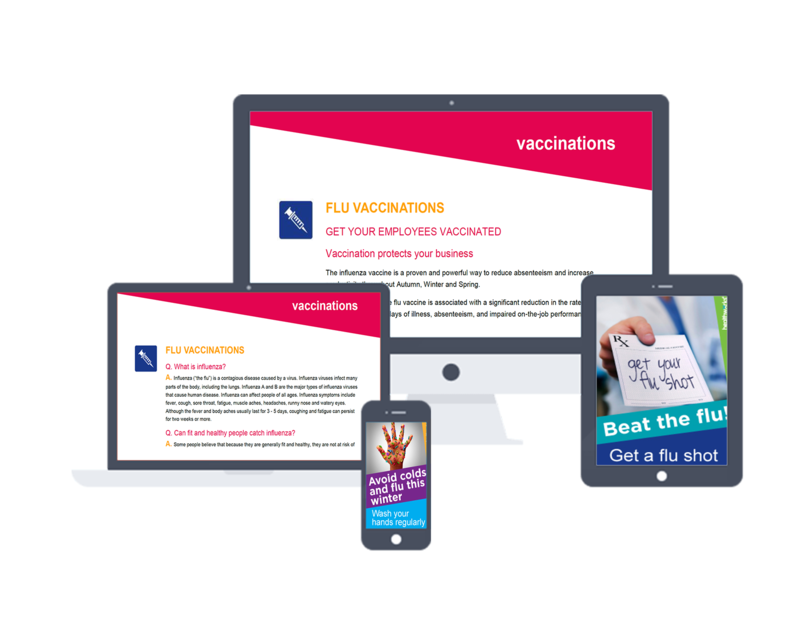 With the best customer service in the industry matched by the most competitive prices, and with a rock-solid reputation as the leader in onsite corporate wellness, you can trust Healthworks to deliver an expert onsite flu vaccination service. Influenza, commonly called “the flu”, is a contagious disease caused by a virus which spreads easily from person to person. Compared with other viral respiratory infections such as the common cold, influenza infection can cause severe illness and can also precipitate serious and life-threatening complications. Influenza viruses infect many parts of the body, including the nose, throat and lungs. Influenza symptoms include fever, cough, sore throat, fatigue, muscle aches, headaches, runny nose and watery eyes. Although the fever and body aches usually last for 3 – 5 days, coughing and fatigue can persist for two weeks or more. 3 things you might not know about the flu shot! This represents 2 changes to the 2018 Southern Hemisphere influenza strain. What are the possible side effects from the flu shot? be severe in some people. These reactions are due to an allergy to egg protein or to other components of the vaccine, including the antibiotics neomycin and polymyxin, which are in the vaccine in small amounts. Some severe allergic reactions can happen within 15 minutes. That is why it is important to wait in the allocated area for 15 minutes after being vaccinated. How effective is the influenza vaccine? The influenza vaccine provides a good level of protection which is 70% – 90% effective in healthy adults. It is important to know that it takes around two weeks after vaccination for a person to develop protection against influenza infection. Also, the influenza vaccine does not protect against respiratory illness caused by other viruses, such as the common cold. Can I catch influenza from the vaccine? No. It is impossible to “catch” influenza from the vaccine. The influenza vaccine contains only “killed”, inactivated virus particles. Because the virus particles are not live, they cannot spread through your respiratory system or cause illness like the real virus. What are the benefits of flu vaccinations? There are lots of reasons to get a flu vaccine each year. Flu vaccination can keep you from getting sick from flu. Protecting yourself from flu also protects the people around you who are more vulnerable to serious flu illness. Flu vaccination can help protect people who are at greater risk of getting seriously ill from flu, like older adults, people with chronic health conditions and young children (especially infants younger than 6 months old who are too young to get vaccinated). Flu vaccination also may make your illness milder if you do get sick. Flu vaccination can reduce the risk of more serious flu outcomes, like hospitalizations and deaths. Is it safe for me to get the flu shot if I am pregnant? Yes, the flu vaccine can be safely given during any stage of pregnancy. Pregnant women are at increased risk of severe disease or complications from the flu. Vaccinating against flu during pregnancy can not only protect pregnant women but provide ongoing protection to a newborn baby for the first six months after birth. If in doubt, please speak to your doctor to confirm it’s safe to continue. Should I receive the vaccine if I am feeling unwell? If you are suffering from an acute feverish illness (temperature equal to or above 38.5 °C) you should not receive the vaccine until you have fully recovered. If you are suffering from a mild illness and do not have a fever, there is no reason why you should not receive the vaccine. If you are feeling unwell at the time of you vaccination appointment, please discuss your symptoms with the nurse. If I get a side effect after I have a flu vaccine, where can I report it? You can report adverse events to us (AVS) on 02 8097 0753 and your doctor. Side effects or adverse events following any immunisation can also be report to the Therapeutic Goods Administration by calling the Adverse Medicine Events Line on 1300 134 237 or lodging a report online at the TG website, via the ‘report a problem link’. AVS is keen to assist with this process as its important to record adverse reactions.